The right paddle is so good you forget you’re even using it. It just becomes an extension of your body. But the wrong paddle can make your time on the water feel like a chore. Above all, paddleboarding should be a blast! That’s why SUP enthusiasts, experienced paddlers, and pros choose the lightest and most efficient paddle that fits their budget. Let’s take a look at some of the most popular materials for paddle shafts, grips and blades along with their benefits, the optimal blade shape for all-around SUP, and the other features that set the best paddles apart. Wood paddles have a classic look that can’t be denied. We’re so into heritage materials that our boards have become known for their wood-inspired deck graphics. However the weight and the added maintenance required to keep a wooden paddle varnished and protect it from rot makes it a better choice for hanging on the wall of a boathouse than taking out on the water. These days there are much better options for performance. An all plastic paddle construction is sometimes found in kids SUP packages, but full-plastic paddles aren’t typically used by adults. The forces adults deliver are too great and a plastic shaft is prone to sun damage and warping with repetitive stress. Many adult paddles feature plastic paddle blades however, and the quality of the blade material varies widely. Nylon is a special type of plastic known as a polyamide. Polyamides are polymers made up of a chain of long, heavy molecules arranged in endlessly repeating sections like the repeating links of a metal chain. Unlike the lighter and faster fiberglass or carbon, nylon paddle blades can take a beating. They resit dings and nicks. So, they’re more forgiving when pushing off a dock, finding your balance on the bottom, and for overall wear and tear. A high quality nylon paddle blade strikes a great balance between durability, and affordability making nylon a great choice for most people. Aluminum is an affordable material often used in the paddle shafts. While it’s not as stiff as fiberglass or carbon, it’s lighter than wood and typically paired with a plastic paddle blade. Beginning paddlers often opt for aluminum if their board doesn’t already come with a paddle because it’s cheap. Most entry-level SUP packages include an aluminum shaft to get started. Fiberglass is lightweight and rigid, although not as rigid as carbon fiber. The rigidity of the paddle determines how efficiently you transfer power to your stroke. So, while it’s more expensive than aluminum or plastic, fiberglass also performs better and helps to reduce fatigue. Carbon fiber is the lightest weight, most rigid, and best performing material for paddles. Its unique molecular structure makes it the best known material for transferring power from your muscles to your stroke to the water as thrust. It’s also incredibly lightweight and durable. Whether you go with a carbon shaft model or a full-carbon paddle, that means you’ll experience less fatigue and be able to paddle faster and farther with carbon. Because of it’s ultra-high performance qualities, light weight, and the manufacturing expertise required to shape carbon, it’s also the most expensive option. 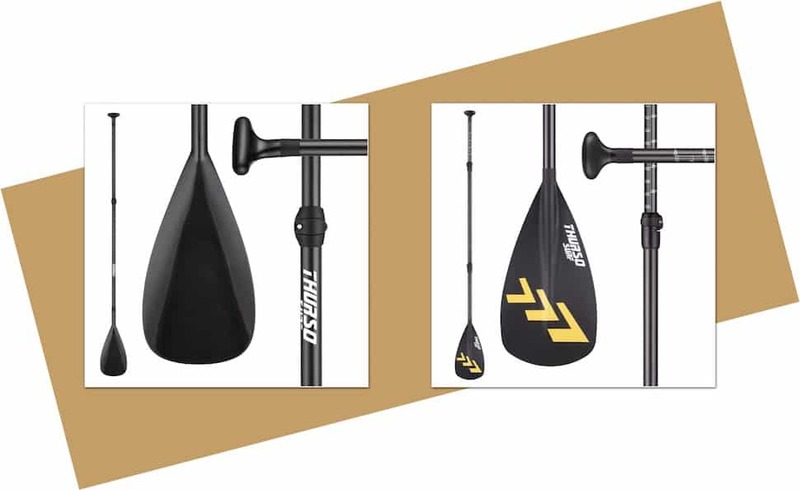 For the ultimate in performance and comfort on the water choose a carbon fiber paddle. What makes carbon fiber awesome? Carbon is smarter than you think! Carbon fiber paddles have better ‘memory’ than other materials. That means they don’t bow, bend or lose shape as much as fiberglass, aluminum or plastic. Sounds cool, right? Less distortion means less torque working against your grip strength and reduced paddle flutter. Less flex and flutter mean more power transferred directly to the water. So in addition to being ultra-lightweight (our Carbon Elite Paddle , carbon fiber also performs better, dramatically reducing fatigue where it matters, your neck, back, arm muscles and grip. It helps you go faster and farther whether you’re an expert looking to shave time off your race results or a total beginner just looking to have fun. Why do we include a carbon shaft paddle in all of our SUP packages? Did you realize that in just an hour of paddling you could take more than 1000 strokes? That means your paddle is the second most important piece of gear next to the board itself. Yet many SUP packages include a paddle as an afterthought. We take a different approach. 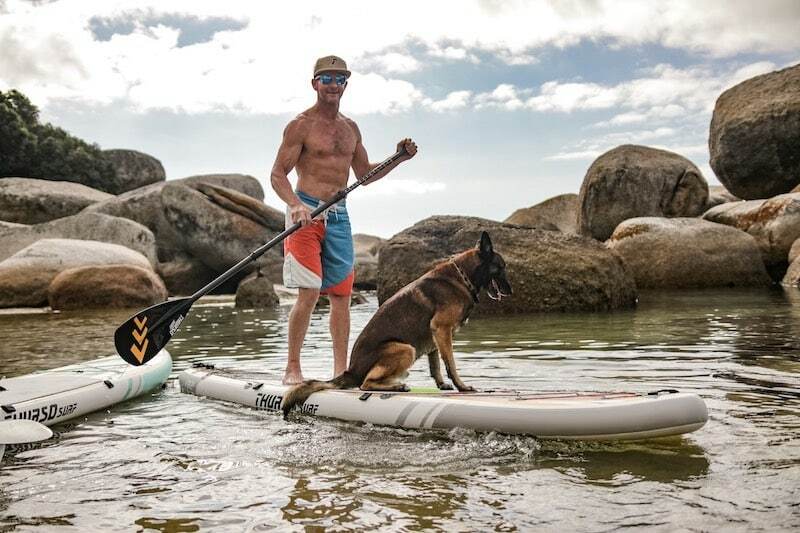 Reducing muscle and joint stress isn’t just for top athletes and pros, it makes EVERYONE’s time on the water more comfortable and fun, from beginners to experts to kids! We think that when you’re less fatigued and relaxed, you have a better time on the water. That way you can concentrate on the best parts of paddling, whether that’s enjoying the beautiful scenery, interacting with wildlife, having a blast with family and friends or paddling harder and faster than ever! Our premium Carbon Paddle comes standard with every SUP package and weighs just 32 oz/900 g, while our Carbon Elite Paddle saves you even more weight, clocking in at just 27 oz/765 g. Both paddles are designed to float on water and can even be converted to a kayak paddle. More on that below! Blade size is a matter of personal preference but generally speaking, larger blades are both more powerful and require more power to pull through the water, while smaller blades are more efficient but require more frequent strokes for the same thrust. When choosing a paddle blade that typically means that larger paddlers who are stronger are able to manage medium to larger blades, while smaller paddlers stick to blades with a small to medium surface area. A large blade size can be helpful when you need to sprint to catch a wave, whereas a smaller blade is better for preserving your energy on long distance trips. No matter the size of your paddle blade, you can manage the thrust you get from it with your paddling cadence. If you’re getting into highly specialized areas of the sport or find yourself paddling too fast or too slow for comfort you may want consider a different size blade but for most paddlers a, medium-sized blade between 85 and 105 sq. in is a great choice for all-round activities. The Thurso Surf Carbon Elite Paddle pictured left, and the Carbon Paddle part of every SUP package pictured right. A shorter, wider blade will deliver more forceful, immediate power as soon as your blade catches the water, whereas a longer, narrower blade blade delivers slower-paced strokes and is easier on the shoulders. You could compare a shorter, wider blade to low gear in a car vs. a longer, narrower shape to a higher gear that doesn’t give you the same burst output but is more efficient over the stretch. We’ve refined our paddle blade shape after rigorous testing to provide the best experience over a variety of paddle activities. Since shorter, wider blades are more prone to flutter and more demanding of grip strength, we’ve finally settled on a hybrid rectangular shape with a dihedral power face. The dihedral face has a ridge running down the center of the paddle that helps it shed water evenly to either side. This further reduces the fluttering effect you may find with flatter, wider paddle faces to ensure each and every stroke is smooth and powerful. The reinforced rib on the back of the paddle increases rigidity and prevents the face from distorting no matter how hard you pull. It’s designed to boost your performance beyond expectations whether you’re cruising, surfing, or racing! The offset angle of your paddle blade determines how vertical the blade is as it travels through the water. This defines the power phase of your paddle stroke. Offset angles vary from 5-15 degrees across all activities. A SUP surfer who wants fast power delivery would tend to look for an offset angle closer to 5 while a long distance cruiser may favor an offset angle closer to 15. Since we like to keep our options open we’ve chosen an offset angle of 10 degrees. Right in the sweet spot for all-round paddling. For more on how the offset angle affects your stroke, check out our post ‘The Best Paddle Stroke for Beginners‘. If you’re really dialed in on performance for a specific aspect of the sport and you’re counting weight down to the gram, you might benefit from having a quiver of fixed-length paddles rather than a single adjustable paddle. They tend to be slightly stiffer and without the required locking mechanisms found in adjustable paddles, they can also be a bit lighter. 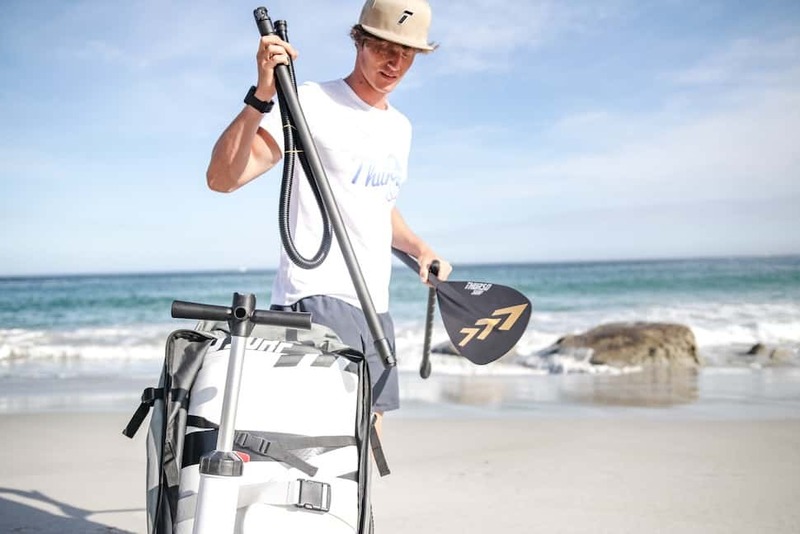 However for most paddlers, experts included, an adjustable paddle is a better choice that can be packed, transported and stored easily as well as adjusted on the fly for optimal performance. Our 3-piece adjustable paddle is ready to travel or store in your board bag. A 3-piece adjustable paddle is the ultimate in portability and versatility. It lets you experiment with different blades and fine tune your paddle length for different activities. For SUP surfing and whitewater, your paddle should typically be 4”-8” inches longer than your height. For touring, cruising, fitness and yoga 6” to 10” inches over your head is the right length. And for racing, 8” to 12” tends to be best. Ultimately with an adjustable paddle you can find a length that feels right for you, based on your posture, cadence, strength, and style. A 3-piece adjustable paddle will also fit easily into any vehicle and store comfortably in your board bag, even on a flight. At the other end of the paddle is the handle grip or grasp. You’ll want to look for an ergonomic design that feels great in your hand. It should be easy to adjust to your height and the paddling conditions securely while on the fly. Keep in mind that paddling conditions change and you may need to adapt your paddle while you’re on the water as well as on land. That means a safe and secure locking mechanism that is easy to operate is paramount. Our safe and secure locking mechanism is easy to operate on land or water. Our handle grasp is a precision molded ergonomic design. It’s easy to identify which end faces forward by its shape and the markings on the shaft. It’s also secured with a double-lock system that is identical on both ends. The spring loaded pin ensures your blade or grasp stay locked in place and never get lost on the water. And the clamp guarantees that there won’t be any play or power loss. The double-lock setup is easy to adjust from 71”/180 cm to 87”/220 cm in 15 seconds or less and it’ll hold both the grasp and paddle blade flawlessly. Coming soon! – Kayak blade and updated adjustable Kayak Seat. A unique feature of our 2019 carbon shaft is that the double-lock mechanism accepts a handle grasp or blade on either side. That gives you the flexibility of adding a second blade to the paddle included in your SUP package. 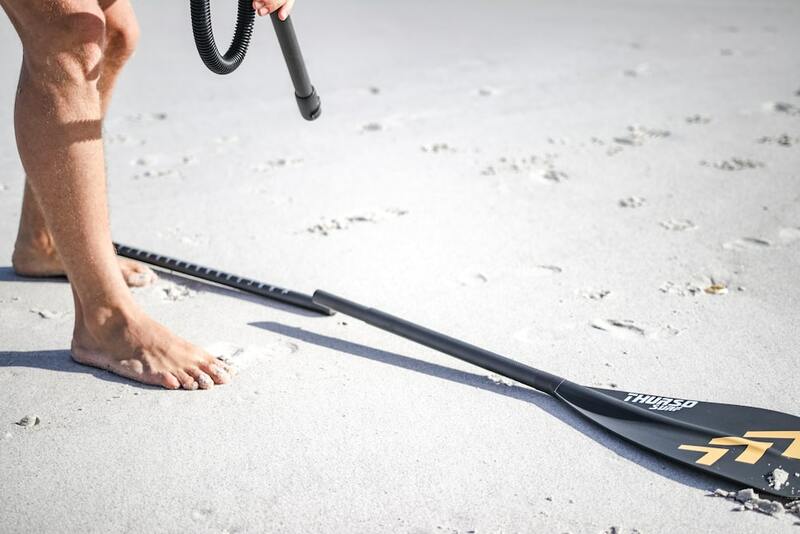 Now you can use the ultra lightweight carbon shaft you already have and, just by swapping the handle for a second paddle blade, you get a high-performance carbon kayak paddle. Not only does that mean you get two paddles in one, but you only have to carry one extra blade instead of two whole paddles saving you cash on a premium carbon paddle for both sports and precious space in your board bag! Keep an eye out for pre-orders on a nylon and carbon kayak blade coming in Spring 2019!